California State University, Fullerton, known to students and alumni as Cal State Fullerton, is located in Fullerton, California. The Cal State Fullerton College of Communications is located on the university’s main campus. Although the university has offered communications studies for a very long time, in 1988 the university recognized the growing importance of communications in today’s world and combined the Department of Communications and the Department of Speech Communication into a new, comprehensive school of communications. The College of Communications is composed of three departments. The Department of Communications offers a Bachelor of Arts degree in communication. Students can choose to focus on advertising, public relations, entertainment studies, photocommunications, journalism or print and broadcast. The Department of Human Communication Studies offers a Bachelor of Arts degree in communicative disorders or speech communication. Students pursuing the speech communication degree can choose to focus on intercultural communication, communication studies, advocacy, interpersonal communication, or organizational communication. Cal State Fullerton offers a Master of Arts degree in Communicative Disorders program that is geared towards preparing students for clinical certification and licensure on the state level. Clinical experience is offered on campus through the College of Communications in the school’s clinic or off-campus in various locations, including local hospitals and public schools. The College of Communications also includes the Department of Radio, TV and Film. Students can earn a Bachelor of Arts degree in Radio-TV-Film, as well as a masters degree in screenwriting. The Cal State Fullerton campus features television, radio, film and photography studios, in addition to a graphics and digital imaging lab. 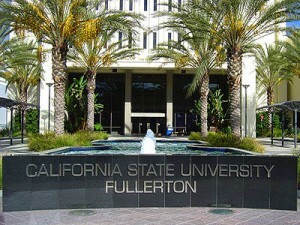 In the fall of 2011, student enrollment at Cal State Fullerton reached more than 36,000 students. The school was founded in 1957, and is notable for its striking appearance, which is due largely to the large number of futuristic buildings that were constructed in the 1960s. In 2008, the new Student Recreation Center opened its doors. The new building covers 95,000 square feet spread over two floors and includes a huge gym, a rock-climbing wall and pools. In the fall of 2011, a new housing complex, complete with a convenience store and dining hall opened at a cost of nearly $150 million. The university has a proud athletic tradition and can claim 13 national championships in various sports since 1971. The Cal State Fullerton Titans are members of the NCAA Division I Big West Conference. The Cal State Fullerton baseball team has won four national titles, and the Dance Team currently holds the school record with 10.